A new book recently came across my baking radar entitled Sweet Chic: Stylish Treats to Dress Up for Any Occasion by Rachel Shifter Thebault. Now I didn’t recognize the author’s name, but if you are from New York you might know her as the owner of Tribeca Treats. Oklahoma is a long way from The Big Apple, but I wish we were closer because the desserts at her shop look divine. But since we are many states and hours away, I am so glad I got my hands on this cookbook. Ms. Thebault has put together a fantastic cookbook that is perfect for everyone from the novice baker to someone with more experience. When I first started my foray into baking and cookie decorating, I had to scour the web for information. I didn’t know the difference between baking soda and baking powder. Fortunately for novice bakers, the beginning of the book walks you through baking basics including how to correctly frost a cake without all those annoying crumbs. For the more advanced kitchen guru’s, she includes tips on ganache and candy making. The book is divided into three sections starting with cookies first and then progressing through cake baking and then finally advances to confections, which take a bit more experience to do. She creatively uses fashion as a metaphor throughout the book and shows you how to take your basic white t shirt (cookies), navy blazer (cake), and your favorite purse (confections) and accessorize them to make your basic recipes into a something unique and versatile every time you serve them. Fashion emergencies throughout the book help you trouble shoot when things don’t go quite as planned. There are also tips on polishing your look that help to elevate the already scrumptious desserts to a higher level. My favorite part of the book though, besides the numerous unique recipes, is “The Best Dressed List” printed on a darker color paper so it is easy to find. This table shows how to accessorize all the cake flavors and sandwich cookies with all the frosting flavors. 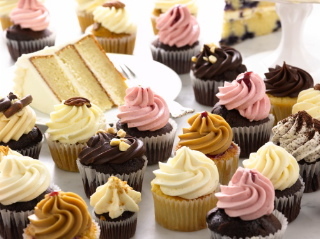 It makes figuring out which cake will taste best with which icing a snap. The recipes include basics such as chocolate chip cookies, devil’s food cake, and cream cheese icing but also several that I had not seen before including graham crackers, pecan spice cupcakes, salt and pepper chocolate, and ginger truffles to name a few. Just like you can take your basic little black dress and accessorize it for the office or a dinner party, Sweet Chic is a manual to inspire you to take that plain devil’s food cake and accessorize it into a sweet and salty cake for company or rocky road cupcakes for the kids. A copy of this book was provided for review. ← Almost Time for Dragon*Con!